What is it? A real-time stealth puzzler with 100 levels and a level creator for more. Volume is a pretty good stealth puzzle game. 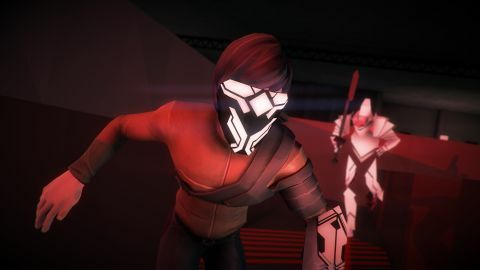 It could be called 'Pretty Good Stealth Puzzle Game' and I would agree with it. "Hey, that's what you are," I'd say. As a futuristic Robin Hood tale with a mysterious name like 'Volume,' however, Volume is not as good. It's often amusing, but Volume's comments on wealth distribution and moral responsibility are ultimately pretty mundane, no matter how hard the theatrical score tries to elevate it all. (There's even a choir doing ominous 'oooohs.') Meanwhile, its protagonist, Rob Locksley, sounds so bored I expected him to give up on saving the world halfway through to watch YouTube videos. Maybe seeing a goat cuddling with a duckling would get him to feel something. But as 100 stealth levels, Volume is pretty good! It’s played from an overhead perspective, with WASD to move Rob through small puzzles, avoiding guards and collecting gems on the way to the exit. It’s very similar to The Marvellous Miss Take, only better—better looking, better level design, better gadgets—and without the randomized guard behavior. Volume’s levels are puzzles, plain and simple. Guards do one thing over and over, and there’s almost always a clear solution. Say there’s a guard looking through a doorway, for instance. At the most basic level, I might crouch behind a half-wall near him, whistle to get him to move off his post, and then creep around the wall as he comes looking for me. In a more advanced puzzle, I might have to shoot a noisemaker gadget I found earlier in the level, lure one guard away from a group of marching guards, and then let him rejoin out of formation—right behind another guard instead of evenly spaced—to create a gap I can squeeze through. It’s about identifying and disrupting patterns. The complexity rises every few levels, when new, extremely Stealth Game ideas are introduced. You can hide in closets. There are forcefields blocking paths that need to be deactivated. Dogs have better peripheral vision. Archers have long, narrow vision triangles, but are slow to shoot. There’s a gadget that distracts guards with a curious object, one that disguises you as a guard, one that makes you invisible, and so on. A lot of ideas are introduced at an even pace. I especially liked puzzles designed around jumping over short walls. As guards can’t do the same, you can force them to run little mazes while you take shortcuts, off to the next section of the level before they have any clue what’s happened. It’s fun, if sometimes too obvious and simple, to game the guards’ AI. There were two levels that infuriated me (screw lasers), but for the most part, Volume is pretty tame. There's some tricky maneuvering—such as avoiding pressure plates that emit guard-alerting sounds while also keeping out of sight—but I rarely got stuck on anything for long. Many of the puzzles are satisfying to solve, but few are difficult to figure out. I never had a big 'aha' moment, and that was disappointing. The difficulty is heavily mitigated by checkpoints, which are placed throughout the levels and not only act as respawn points, but also save any gems or items you’ve picked up so far. I appreciate that I’m not asked to redo an entire level because of one mistake, but checkpoints can be abused. I discovered early on that if I grabbed some gems and was spotted by a guard, I’d be fine as long as I made it to a checkpoint before being killed. Hell, even if I fell through the checkpoint while in my ‘I’ve been shot and am dying’ animation, I still respawned there and kept my progress. It feels like cheating, which isn’t a good feeling, but I wasn’t going to forego a simple solution on principle. Heck, I often abused checkpoints by accident, running through one while just trying to escape a pursuing guard. It’s funny that mid-death checkpointing is allowed, given Volume’s premise. The idea is that you, as Rob Locksley, have hijacked an evil corporation’s old AI and are livestreaming simulated burglaries of real places. You’re showing the public how to take back the wealth that’s been hoarded by the elite, and they’re going out and doing it. Except I figure they die whether or not Rob made it to a checkpoint. The danger of Rob’s suggestion is addressed, to be fair. The story is mainly told as Rob’s hijacked AI (Alan) talks to him every few levels. Alan is voiced by Danny Wallace, who is funny, emotional, and delivers the best AI voice performance in a game since GLaDOS. The cartoonishly evil corporation owner also chimes in now and then, and is voiced by Andy Serkis. Andy Serkis is great. He is the great Andy Serkis, so that’s assumed. Rob himself, however, is voiced by musician and YouTube star Charlie McDonnell, and it doesn't work. I understand the choice—Rob is a kid livestreaming a game, essentially, so a YouTuber makes some amount of sense—but it doesn't work. McDonnell seems like an affable fellow, but he’s painfully outclassed. While Danny Wallace is discovering what the world’s become, struggling with his lack of free will, and cracking jokes, McDonnell is reading words. He sounds like he’s been woken up at 4 am, handed a script with only his lines, and told he can go back to bed when he’s done. By the end, I did not like Rob at all. Had I liked him, there would’ve been some enjoyable moments. The best bits are when Alan shares comments from the outside world: Jim Sterling (as Tuck) gives Rob’s stream a scathing review, another viewer raps about it. Had Rob’s response to his fame not been total apathy, I might have had fun seeing his character progress. And I was disappointed that aside from those moments, and a couple others like them, I felt disconnected from the premise. There’s no way to interface with the world outside of the simulation, where presumably there’s a Twitch chat screaming at me for every mistake, and forum threads about my identity, and news reports, and fan art. I only get to glimpse that world through messages Alan scatters around for me, and Rob rarely addresses the viewers. I left the final, weirdly artifacted cutscene feeling like none of it happened at all. There was no AI, no simulation, no story about a corporation taking over England—just a sleepy kid yammering while I played 100 pretty good stealth levels puzzles. Making level captions is needlessly tedious. But I enjoyed most of those 100 levels, so it's not so bad. Plus, there are more levels after the main 100, because Volume includes a built-in level editor, as well as a sharing and rating system. The level editor is OK. It’s got all the functionality you need to make a level like any of the 100 ‘core’ levels, but bafflingly doesn’t have mouse support. You have to select one tile at a time with WASD and hit Space to place an object. You can’t select a big area and fill it with floor, or right click on something to get its properties. It was a designed for a controller, which is the last way I want to interact with an editor. Still, I’m sure players will make some cool stuff with it, however tedious it is to use right now. I think 100 levels was enough for me, though. There’s some interesting stuff to play with near the end of Volume—including some unique teleporter puzzles—but for the most part I’ve done it all already. I’ve thrown noisemakers, avoided vision cones, and dodged lasers—plenty of them, in plenty of other games. Volume is beautiful (and the triangle explosions are very neat), but I didn't fall in love with its world, so I don't feel any strong desire to crouch-walk around any more of its corners.